Notes and text of the “Ode to Joy” in four languages. I am not sure why this sterling recording has attracted controversy for its supposedly slow tempi, given that Solti adopts speeds virtually identical to that of Furtwängler’s celebrated final live performance at the Lucerne Festival in 1954. The only difference is that Solti opts to take the Molto vivace repeat skipped by most conductors and thus extends its duration by a couple of minutes. 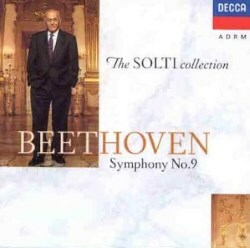 Similar timings do not necessarily imply similar treatment and there remains the question of whether Solti succeeds in maintaining the requisite inner tension in the Adagio or allows proceedings to drag. I do not personally find this to be so; the sheer beauty of the orchestral playing from the Chicago Symphony Orchestra and Solti’s grasp of structure - the meticulous manner, for example, in which Solti builds towards the momentous brass climax at 15:33 - convince me that his is a wholly homogeneous vision. It is true that conductors in other famous versions take very different views of each movement, especially regarding their tempi, but that does not necessarily invalidate either theirs or Solti’s choices as long as the overall conception gels. In the opening Allegro ma non troppo, only Cluytens takes more time, but like Solti here, Furtwängler and Thielemann in his recentish recording with the VPO, his Choral Symphony is a broad, spacious, grandly played account. Conversely, Klemperer, supposedly a conductor often inclined to set more deliberate tempi, live at the Royal Festival Hall in 1957 plays the first movement in just under a quarter of an hour, while Leinsdorf in Boston in 1969 is even a minute faster than that. So much for reputations. Yet in the same performance Klemperer’s Molto vivace is at a leisurely 15:20, whereas Schmidt-Isserstedt and Karajan in the mid-1970s romp home in just over ten minutes. Their dynamism is decidedly effective, with Karajan truly exciting and Schmidt-Isserstedt relentlessly compelling, whereas Klemperer generates a kind of slow-burn menace. Yet I do not detect any lack of weight, energy or drive in Solti’s version; in short, all these conductors make personal, valid and highly effective decisions. However, it is the finale which crowns Solti’s recording and explains why so many previous reviewers rank it amongst their favourites. From the moment the growling double basses make their opening statement through to the glorious paean of universal love, this movement rivets the listener’s attention and sweeps all before it. The sonorous quality of the Chicago Symphony Orchestra combined with the power and attack of the Chorus would themselves almost be enough to recommend this recording, but the addition of a stellar vocal quartet clinches it. A young Martti Talvela had already contributed magisterially to the equally recommendable Schmidt-Isserstedt recording in 1965, but the distinction of his singing here eclipses even that. Stuart Burrows is one of the few tenors able to retain sweetness of tone while ensuring that every note penetrates the glorious din; Solti deliberately trivialises the “toy band” episode just before the final explosion in order to heighten the impact of his entry. Pilar Lorengar’s vibrant and faintly tremulous soprano creates a kind of febrile excitement and even Yvonne Minton, through her trenchant tone, does the impossible by drawing the listener’s attention the beauty of the mezzo-soprano’s harmonisations. In short then, as long as you respond to Solti’s daringly etiolated tempi in the Adagio, this is definitely among the top choices for a library recording.